Haven is a quiet reflective service held on the last Thursday of the month at 6pm at St Aidan's. It can be a time set aside for silent prayer or contemplation, followed by wine, coffee or tea. People are welcome to stay and chat into the night. 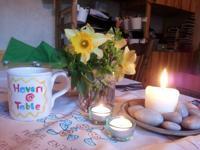 A shared meal, where we talk together about life, faith, politics, spirituality, with a few minutes quiet reflection. Anyone! Our group includes those who’ve been people of faith for a while, and those who are exploring spirituality.